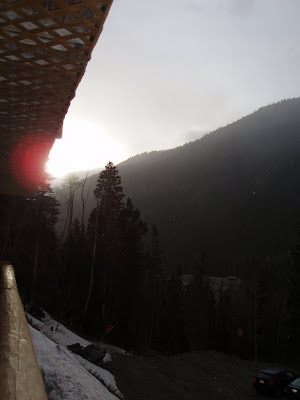 The weather has cleared and when Cat Valente and I went down to the actual town of Taos (we stay up in the mountains at a ski lodge in the empty off-season ski valley we stopped for a bit at the Rio Grande gorge. 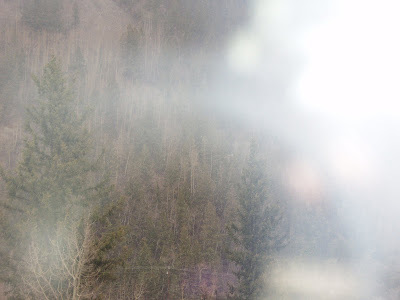 The mountains are about fifteen miles away, I'd guess. We are below the snow line. Bob asked that I take lots of pictures. I don't take very good pictures. But with a digital camera I can take lots and maybe post a few of the better ones. I know that the blog is beginning to be reminiscent of that Saturday Night Live skit, "Francisco Franco is still dead," but it's still snowing. I'm cooking dinner tomorrow so I'm a little miffed because I like watching the snow, but I'm not so pleased with driving to the grocery in it. Luckily, despite living in Austin, I still have a Cleveland car--an all wheel drive Subaru Outback. On Sunday morning I will leave here, and drive west, dropping 10,000 feet into the desert and ending up at work on Monday in Pasadena, California. I have to think that we were not evolved to make these kind of major climate and pressure changes. But then, an airplane is even more abrupt. Weird to have a life where locations are starting to feel like many rooms. Open this door and walk into snow. Open that one and sun and sea coast. Very science fictional. 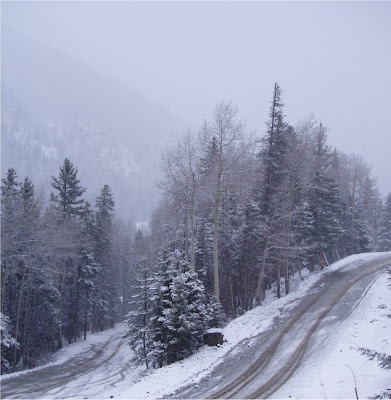 It's snowing again today in Taos. It's awfully fun to be spending a week in a beautiful place have intense discussions about the presentation of social marginalization and the dangers of appropriation in stories and a host of other topics that seem about as exciting as the tax code to most friends and family. I wonder, do accountants go to conferences where they have intense discussions about what the ramifications are of the way things are reported on balance sheets (think Enron) and does it send them into such paroxysms of passion and delight? Tonight is Margarita night at the Rio Hondo Writer's Workshop. A yearly traditions. And a Margarita at sea level is a pleasant experience. A Margarita at 10,000 feet, possibly a transcendent one. We're staying in a lodge in the mountains. In May, at 10,000 feet, there is still snow on the mountains this year. And in fact, it snowed today. I don't see much snow these days, unless you count flying over the mountains into Los Angeles. I am delighted. For Cat Valente (residing in Cleveland) and Alan DeNiro and Kristin Livdahl (Minneapolis) it is probably not as delightful. 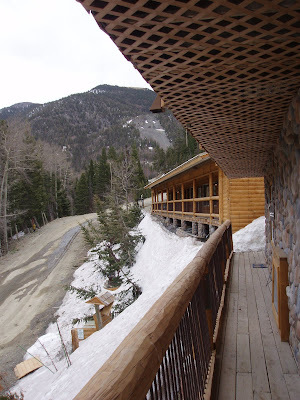 But ski lodges are good at providing comfort in snow. 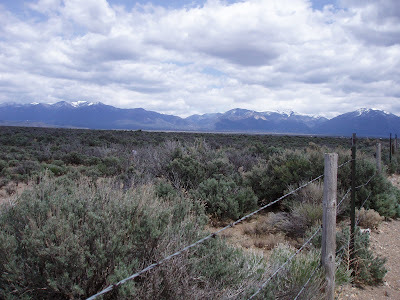 I drove to Taos, New Mexico from Austin, Texas using Bob's GPS Navigator. When digital watches got big, I found that unlike the hands on my Timex, a digital watch always told me precisely what time it was. But what it didn't show was what time it would be and what time it used to be. Time was a radius of a dial in my head. A GPS is like that. It showed me precisely where I was. But I had programmed it to give me directions to Taos. I knew I was going to stop for the night in Clovis because I made this drive last year. I drove up through the Texas Panhandle, around Lubbock. I got hungry. When I got to Muleshoe, I knew exactly where I was but I didn't know if Clovis was half and hour away or an hour and a half away. So I decided to stop for dinner in Muleshoe. I ended up at Pizza Hut. I don't particularly like Pizza Hut, but frankly, in Muleshoe, I wasn't sure if I wouldn't drive all the way through town and back into the empty panhandle. 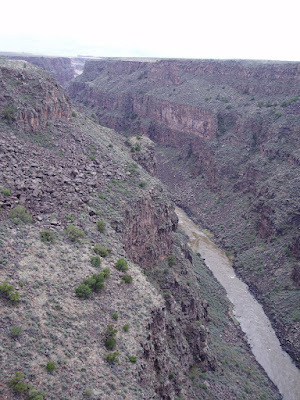 Muleshoe is not large. I had a really indifferent plate of pasta and then took this picture from the parking lot. As far as I can tell, Muleshoe is basically a cluster of buildings on the highway. Clovis, while not a giant metropolis, is a decent sized town. It turned out to be 27 miles away. 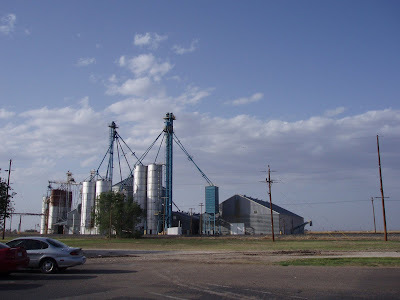 I'd have probably had a better dinner there, but I would never have gotten the great photo of a Muleshoe grain elevator. Tonight I am in Clovis, NW. 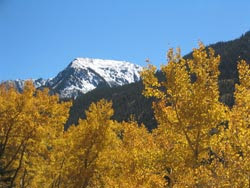 Tomorrow I will be in those mountains where I will hang with writers and have a wonderful week. And I just found out that although Clarion and Clarion West have closed their application process for this year, Taos Toolbox has not. Walter Jon Williams and Kelly Link are teaching this year.